Hi everyone. I hope you've all had a peaceful Christmas and have had chance to think back through everything that 2018 has delivered as we reach its conclusion. 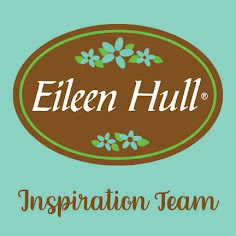 Over on Eileen Hull's website her Inspiration Team have been sharing some of their favourite projects from 2018. As part of this I began to look back through the pieces I'd made this year and realised that my favourite has not made it to my blog yet! It's a mixed media Wrapped Journal that features lots of Eileen's die designs and incorporates a number of embossing powders from Emerald Creek Craft Supplies. As you'll see from the following video flip through I added lots of fabric, lace, papers and stitching to the Journal cover and pages, sticking to neutral tones throughout. To enhance the die cut shapes and add beautiful texture to the journal I used a number of Emerald Creek Craft Supplies embossing powders. Embossing powders from their Allure range used include; Burnt Copper Leaves, Hammered Metal, Charred Gold, Oil Rubbed Bronze and Fractured Ice, which can be found on their website HERE. I found that by adding a layer of Glossy Accents to glue the unheated powder in place I could leave it in it's raw form so that the wonderful mix of granules and colours could shine through. This was also a great way to semi heat set the powders too. To keep the loose powders in place when fully heat embossing Ranger's Emboss It Dabber is also really good as it delivers enough sticky ink to hold the larger granules as well as the smaller ones. I hope you've enjoyed seeing inside this Wrapped Journal in more detail. 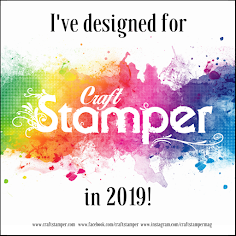 As 2019 beckons the team are now working on creating new projects to inspire you using Eileen's fabulous new upcoming dies. She will be sharing more about these in the coming weeks so stay tuned to her Facebook Page for that. For now all that remains is for me to wish you all a creative, positive and enjoyable 2019. Hi everyone and welcome. 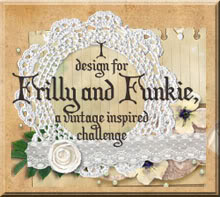 Over at the Frilly and Funkie Challenge blog we start the final challenge of the year today. It's Suzz's turn to host and she's calling her challenge 'In The Kitchen'. This time of the year we find ourselves in the kitchen either preparing food for family and friends or just gathering around with family who is visiting at the kitchen table. Your challenge is to incorporate the kitchen somehow in your project. You can use an object from the kitchen in creating your project or you can use a sentiment or image that reflects the kitchen. You decide how to represent being in your kitchen in your art. For this final challenge of the year I've hopped over to the Frilly side of the Design Team as a one off, so this card is all about the paper layering and everything shabby chic in style. Can you spot the kitchen connection? You'll see from the close up shot further down this post that some deliberately rusted silverware is piled into the centre of the festive foliage. Now this card may look super complicated but actually it's easy to recreate. I started by taking a couple of those sheets of Christmas Worn Wallpaper and scrapped some White Acrylic Paint across the burgundy one sparingly to lighten it. Chopping it into layers these were added one above another to create the basic structure of the card. I've been making a lot of Funky Festive foliage recently (see my last DT project as evidence of that!) and used it again here, creating branches from the Silver Metallic Kraft Card with pine cones and berry stems from Classic Kraft Card. I discovered that by cutting the stems from red card, berries from black card and adding Glossy Accents they looked just like elderberries. Now on to that rusty silverware; I took a reinforcer ring from a pack of Etcetera Tags, coloured it with Aged Mahogany Distress Paint, sanded the edges and adorned it with a real rusty washer. To follow the challenge them I took some Tim Holtz Adornments Silverware and covered it with a mix of Rust and Espresso Alcohol Ink before adding Seth Apter's Baked Texture Chunky Rust Embossing Powder for that touch of added realism. In fact they looked more rusted than the real rusty washer so I added a little of the same embossing powder onto that too! After piling all those elements together on top of the layered Wallpaper all that remained was to add a sentiment from the Glorious Gatherings set, stamped on to Metallic Kraft Card. That's it for my Frilly kitchen based project for the current Frilly and Funkie challenge. My talented team mates have created lots more amazing projects for this challenge so make sure you hop on over and check them out HERE. And remember to link up your own shabby chic or vintage entries to be in with a chance of winning one of the fabulous prizes. Hi everyone and welcome. Over at the Frilly and Funkie Challenge blog we are half way through a new challenge. It's Maggi's turn to host and she's calling her challenge 'Tis the Season for Gift Giving'. Because it's that time of the year when we're all thinking about the perfect gift for our friends and families, let's combine our crafting passion with our "to do" list by creating a vintage or shabby chic gift for a special someone in your life. Your gift could be as simple as a handmade card or tag, or an elaborate piece of home decor. Maybe you like to place your gifts in handmade boxes? Your imagination is the only limit on this challenge! I decided to create a festive gift box that can be used as a gift in it's own right. It proved to be the perfect opportunity to play with Tim Holtz Funky Festive die set. I used the largest of the Vignette Boxes, Vignette Panels and corresponding Vignette Frame, adding a couple of Vignette Finials, covering them in first Walnut Stain Distress Paint, then with a little less Brushed Pewter Distress Paint and finally dry brushing them with White Gesso. At this stage the lid was assembled using Glossy Accents to stick the frame and finials in place firmly. The corner Vignette Accents from the Halloween set were added to two opposing corners. Some Christmas Worn Wallpaper was cut to fit the box sides with the edges distressed. I also added a piece of thick mount board covered with the Worn Wallpaper to the underside of the lid to prevent it from sliding off. That's it for my gift giving project for the current Frilly and Funkie challenge. My talented team mates have created lots more amazing projects for this challenge so make sure you hop on over and check them out HERE. And remember to link up your own shabby chic or vintage Halloween gifts to be in with a chance of winning one of the fabulous prizes. Hi everyone and welcome. Over at the Frilly and Funkie Challenge blog we are half way through a new challenge. It's Kathy's turn to host and she's calling her challenge 'A Harvest of Gratitude'. There is always something to be thankful for. In this gratitude themed challenge, we are asking you to create a vintage or shabby chic project that portrays something that fills your heart with thanksgiving. Use harvest colors and be sure to tell us how your project reflects your thankful heart. For my project this week I chose to celebrate and give thanks for the things that are most important to me, my family and friends, health and well-being, home and all the memories it holds. With Autumn in full swing here it's such a special thing to see the changing colours on fallen leaves as I walk our dog. There's such a lot to be thankful for. I began by adding sticky back canvas to a small Etcetera Tag before covering the front, back and two of the 'enforcer rings' with black gesso then Aged Mahogany Distress Paint. Once dry I sanded the tag and rings lightly, concentrating particularly on the edges, to give it a more age-worn look before rubbing Potting Soil Archival Ink over. You'll have spotted from the finished tag that I added two rusted metal rings from my stash on the rings. After adding a piece of vintage book page with Distress Collage Medium over the canvas covered area I dried it, spritzed it with water and peeled away some of it. Finally Texture Paste was spread through the Code Layering Stencil and covered with Dirty Sand Embossing Powder. When dry I heat embossed it to reveal the shimmer and gritty texture. For the Skeleton Leaves and Funky Foliage I covered three separate pieces of white card in Distress Paints before die cutting them. The first had a combination of Walnut Stain and Brushed Corduroy Distress Paint dragged over it with a little water to create this mottled look. The process was repeated on a second piece of card with Peeled Paint and Crushed Olive Distress Paint. The third piece of card had a combination of Aged Mahogany and Wild Honey added to it. I used Distress Markers to cover the white edges caused by die cutting and some Glossy Accents on the acorns and rose hips before layering them onto the tag over a Baseboards Frame with a bow and Quote Chip. The little blue flowers had previously been cut using the same die set and were coloured with Faded Jeans Distress Paint. That's it for my Thanksgiving project for the current Frilly and Funkie challenge. My talented team mates have created lots more amazing projects for this challenge so make sure you hop on over and check them out HERE. And remember to link up your own shabby chic or vintage Thanksgiving entries to be in with a chance of winning one of the fabulous prizes. Natural Woven Jute Ribbon - 1"